Today is the anniversary of my Grandma Flo's passing, a year ago her body lost it’s well fought battle to Alzheimer’s. This is what I said at her funeral. We’ve been in mourning for almost 7 years now. Each in our own way. The grandma/mom/Flo that we once knew has been gone from us, for so long that it seems surreal to be finally here. No matter how hard I try, I can never do justice to who she was in her lifetime. She was a mother, a sister, a grandmother, and a friend to all of us. But I know that this is not the end. And so, now I speak with you, not in mourning. But in joy. Come on, like she’d want any of us up here blubbering. RE-Becca Ann, she’d say, CHIN up. And she’d pat my knee and give it a squeeze. And then she’d give my shoulder a squeeze. She was a squeezer! I’m sure each and every one of you here today could stand up here and share a story of how Flo touched your life. I know that I am the person that I am because she played such an important role in my life. 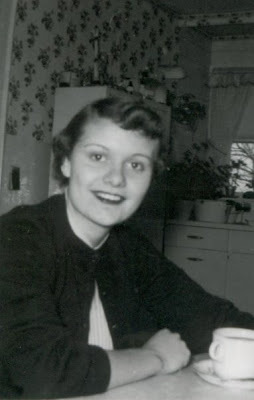 And so, I give you… 21 things I learned from my Grandma. She loved the color Yellow. Always accessorize – look your best when leaving the house. You get just one first impression she’d tell me. And grandma did. Her hair was always perfect. Her clothes and shoes and earrings always matched. Her purse always weighed at least 10 pounds. Popcorn is perfect around 3pm. She’d make me walk to the Little Chocolatier and grab a bag for each of us every Saturday that we worked at the Pumpkin Patch together. Drink 8 glasses of water a day. It helps to wash out the popcorn. If you are going to give a hug, make it a good one. Squeeze hard and show you mean it. Love your family. Love your spouse. And never hold back on showing your love. Love your God – Grandma was proud of becoming Catholic when she and Grandpa were married. When I was little, and usually sitting here in church, RIGHT OVER THERE, she used to tell me that she didn’t know as much about her Catholic faith as she liked, but we could learn together. And then she encouraged me to learn. She was filled with His love. She was bursting with it. In a word, Grandma was love. She lived it. At every get together there must be a family picture – in front of the fireplace for Thanksgiving and in front of the tree for Christmas. Pictures of the oldest and youngest were required on Christmas. There was no use in arguing. She always got her way. There is no such thing as “too much food” on Thanksgiving or Christmas. Left overs can be stored in the breeze-way until the next meal (or whenever Grandpa was hungry). She gave her gift of meal planning to Amy. Carry the torch proudly Amy. 1.2.3. Amy, Tommy, Me. I don’t know why this was so special to her. I just know it was. Enjoy the little things – Hardees before school with a cinnamon raisin biscuit, or biscuits and gravy, was best shared with grandkids and friends. Visit loved ones. Grandma and I took many visits to the cemetery in Harmon. She used to love to tell me about the family and friends that had gone before us. She was so proud of the altar there. We’d walk for hours around, and she’d answer our every question. But the most important lesson that I gleamed from those walks – do what you can in your life to ensure that you end up with the people you love, in heaven. Do unto others as you would have them do unto you. Speak of others as you would have them speak of you. Be a friend to everyone. Moisturize. Take care of yourself. Exercise. Love yourself and the gift that your life is. A little sun is good for you. Get outside. Go play with the cats. Don’t let your sister eat cat food. A little fear is OK too. My grandma feared 2 things – 1. Pierced Ears. 2. Swimming. Amy and I tried to talk her into both. A part of me wondered if the fear of swimming was really a rouse to keep her hair perfect. And truth be told, those clip on earrings hurt way more daily, than the pain of getting her ears pierced, but like all things, once she made her mind up…there was no changing it. Like her Cubs, life is full of disappointment. We must never take it too seriously. We must never get down about it. We must brush off our sadness and move on with a smile. It helps if you have Cubs earrings. Give of yourself. Never was it said that Grandma was stingy. We were not spoiled. We were loved. That’s what she’d say if you asked her. Spoil the ones you love. Give freely; give of yourself as Grandma did. She would give you the sweater off her back. No seriously, she tried it all the time. Especially if it was a red sweater that she thought would look better on me than on her. Hold hands with those you love. 21 things? Did I say 21? I meant 25 things. What were details to Grandma when telling a good story anyway? Adore your husband. And grandma did. It was evident in every meal that was waiting for grandpa when he came home. It was evident in every time she cleaned his glasses at the sink. It was evident every time they danced. She adored my grandpa. She was a role model for the kind of wife I hope to be to my husband. Drop everything for family. I’ll say it again. Stop what you are doing and drop everything when your family needs you. When a baby was born in our house, my mom always came home to a clean house and refrigerator (grandma loved to clean the fridge). When my sister died, grandma saw to it that I was not affected and she got me to my first day of school, even though it was the same day that Bridget died. She made sure that I was protected and taken care of. Take time for your friends. Join a bowling league. It doesn’t matter if you win or lose it’s the laughter that you share with your friends in the end that matters. 25. Life is best summed up in “Beaches.” Grandma, did you ever know that you're my hero? Thank you, thank you, thank God for you, the wind beneath my wings.